Rapidly evolving computer and communications technologies have achieved data transmission rates and data storage capacities high enough for digital video. But video involves much more than just pushing bits! Achieving the best possible image quality, accurate color, and smooth motion requires understanding many aspects of image acquisition, coding, processing, and display that are outside the usual realm of computer graphics. At the same time, video system designers are facing new demands to interface with film and computer system that require techniques outside conventional video engineering. 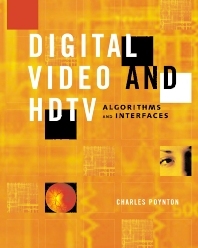 Charles Poynton's 1996 book A Technical Introduction to Digital Video became an industry favorite for its succinct, accurate, and accessible treatment of standard definition television (SDTV). In Digital Video and HDTV, Poynton augments that book with coverage of high definition television (HDTV) and compression systems. Engineers, programmers, and computer graphics professionals who work in fields (such as film and software and game design) that encompasses video for entertainment as well as non-broadcast, non-entertainment applications in business, science, and education, including teleconferencing, Web-based training, sales and marketing presentations, and exploration.